Weather+ gives you current weather conditions and a five-day forecast for locations all over the world. The information is visualized with beautiful full-screen video loops for all conditions. Rain, Snow, Which Way to Go? Swipe the screen from left to right to switch between selected locations. 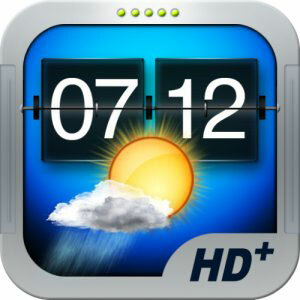 Use the Flip Clock with the World Clock time setting for your current location and another selected location. Switch your settings between Fahrenheit and miles to Celsius and kilometers.